Hi, we are Sheryl & Rick. I work part time in an awesome food truck/restaurant called The Dog House and More and Rick is a food & beverage manager for WAWA convenience stores. We have lived in Ruskin Florida for 5 years and are both originally from Pennsylvania. 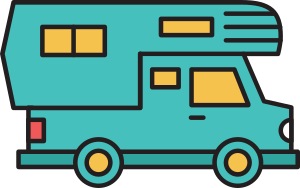 We are considering the full time RV lifestyle and going out on the road,so we thought that this may be a good way to meet some RVers and get some tips & advice. We know how to point you in the right direction for great beaches & stunning sunsets ! Really hope they come back soon! Would love to show them more of the beautiful country around us. Great Hosts & convenient location. Sheryl & Rick are very gracious hosts & I very much appreciate the opportunity to stay at their Little Oasis! I shall return if I am in the area again! A wonderful nights stay at "Our Little "Oasis". Thanks again Sheryl and Rick for allowing us to stay on our way up North. Best wishes from Phil and Jo Hutchison. We had a great time meeting and talking with these folks. We would recommend anyone to stay there. Nice and quiet, and a great garden. Very quiet area with a lovely park and boat ramp around the corner. Our hosts were very friendly and accommodating. Enjoyable stay. Great climate and great hosts. We hope to be back in the fall if they have an opening. Our hosts were so easy going. They were super accommodating for guests. Really appreciated the stay - we were only one night - the kindness was greatly appreciated. Cheryl even gave us a handmade gift from her Oasis - how nice is that! Nice large driveway to park our rig in, next to a Sheryl and Rick’s lovely garden....they certainly have a knack for gardening! Plants are so lush and healthy. And, what a nice couple. They both greeted us and made us feel very welcomed. They gave us a long list of things to do and see and places to eat in the area. As well, they gave us a nice little souvenir as a reminder of our stay..so sweet. Thank you Sheryl! Very convenient. We had friends in the area that we were meeting up with, so we were gone during the days. Rick and Sheryl are hard workers and were busy so we didn’t get to hang out too much. Maybe next time we’ll get to socialize a bit more. Would definitely visit again. Thank you Rick & Sheryl! We had a relaxing stay at this nice property with a terrific , welcoming couple. It was nice to spend some time chatting with them on the porch. We would highly recommend this Boondockers Welcome property. Thank you to Sheryl and Rick for their precious hospitality. Nice place not too far from beaches. We enjoyed. Will return anytime. Thank you for a great experience. I'm new to Booondockers Welcome . Sheryl made me feel comfortable ,helped me get backed in and suggested a few nice places for nearby motorcycle ride before dark. I ended my day a few blocks from their house at a park overlooking the river enjoying the company of some of her neighbors. In short I had fun. Thank you again for sharing your little oasis. You are a blessing and an asset to boondockers welcome. What s great little Oasis! Thanks so much Sheryl and Rick! We had a great time staying @ your place. Enjoyed visiting w/ you both and thanks so much for accommodating us. 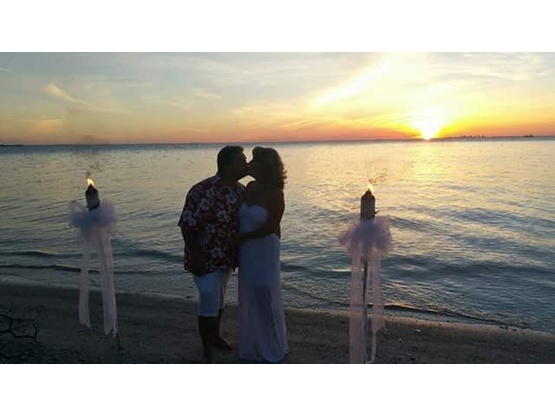 We checked out the nice park in Ruskin and just a short drive down to Bradenton to beautiful white sand beaches and great seafood restaurants. These guys were welcoming from the get-go. We checked at the last minute because we were in a pinch and they immediately replied! They were so accommodating and helpful even supplying us with an information sheet of things to do. Thanks again guys! We appreciate you!! Wonderful hosts! They gave us their entire roomy driveway, and told us we were welcome to set up our chairs, etc. outside, which just happened to face their lovely landscaped yard. They even gave us a three page list of things to do and places to eat in the area. We really enjoyed having a glass of wine with them on their cozy screen-in porch and getting to know each other. 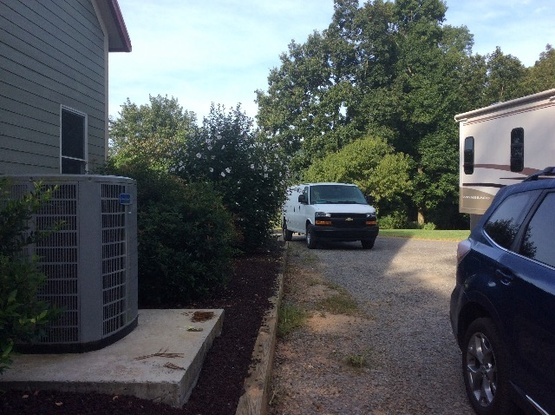 If you have a large motorhome like ours, the driveway does slope a bit in the front, so be prepared to have to level, but there is plenty of room for both your rig and toad. It is also convenient to both Clearwater and Tampa. We would definitely stay here again if return to the Tampa area! Lovely hosts, very accommodating.. and beautiful gardens. A great place to stay as we were exploring the area. Sheryl has a botanical garden for a yard. Very pretty. Next door neighbors are really friendly people. Rick can give you information about the area that most folks don't know. He steered me to a classic car dealership where I enjoyed a collection of awesome, cream-puff '60s vintage American Heavy Metal muscle cars, easily a hundred under roof. 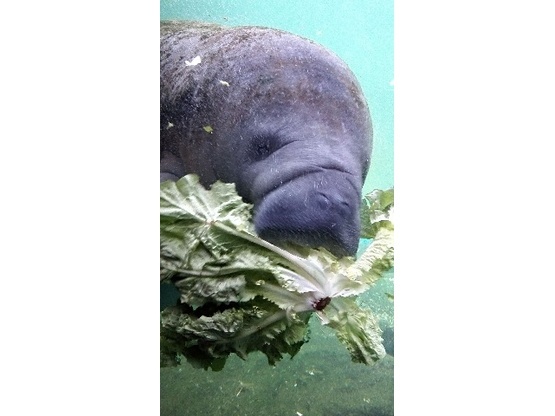 Also the manatee observation post at the local power plant. Nice. THANKS< Rick. Ruskin is convenient to both Tampa and St. Pete, both interesting places rich in history. Likewise, ur welcome at our place, wherever it may be ! Great hosts, great area, will visit again. They were very welcoming when we arrived. We just wish we had more time to talk to them about travel. It was awesome to get a paper with a bunch of neat things to do in the area and restaurants. We will be checking some more of those places while we are still in the area. The Hot Tomato is a must stop , the ultimate Cuban breakfast sandwich is out of this world!! Make sure to stop at this location if in the area . We hope to see them again!! What an oasis. You park on their side driveway looking over their beautiful gardens shaded by live oak trees. Hosts were awesome. Shared a great evening with them and felt we had been friends forever. Cannot wait until we can come back. Thank you for a great time. Lots to do and see in the area. You’ll enjoy the folks & their area! The hosts were great and the parking spot easy to get in to. I enjoyed talking with them and telling stories of my travels. Would definitely go back again. We enjoyed our stay in pleasant surroundings. Great yard with large oaks covered in Spanish moss. Pleasant and friendly hosts. Would definitely stay again. Very friendly and inviting hosts. Plenty of room, enjoyed my stay. Nice spot between Tampa and Sarasota for day trips either direction. Our short stay was great. Sheryl helped us with an area next to her house for our large rig. We had appointments with RV dealers in the Tampa area and Sheryl was so kind to allow us a place for the night. We hope to stop again going back north through FL this spring. Even though she was at work, Sheryl provided perfect info so we could get set up when we arrived. Since both her and Rick are working full time, we didnt have much visiting time but their location was great for our couple of night stop over. Hope we have a chance to see them again! We had a good time in the great location. It is on our list of sites to come back, if in the area. Sheryl and Rick were super nice and very flexible with our changing schedule. Enjoyed meeting them and their hospitality! We will absolutely be back!! Great spot even for a big rig! Sheryl and Rick were very nice and easy going. I enjoyed hanging out with them and their 4 legged crew. We arrived latter then expected so asked if we could stay an extra night. When we arrived we needed to unload our tow dolly before going in the drive way, unfortunately, we got stuck in the soft sand, our host were a great help in digging us out and pulling our 38 ft coach out with there SUV, to our amazement. We celebrated our success with a glass of wine and great conversation. Sherri so sorry. We did intend to call you but due to a breakdown with our car. Sherri so sorry. We did intend to call you but due to a mess up with Priple A and breakdown with our car, we ignorantly forgot. . Once we got the car fixed we just drove home, so sorry truly sorry.